Skipton is a busy market town, complete with castle and a good shopping centre. It's often referred to as the southern gateway to the Yorkshire Dales. Historically, Skipton was a big wool dealing, processing and distribution centre. The Leeds to Liverpool canal network in 1770 and the later introduction of the railway ensured Skipton's continued success in the wool industry. Sheep and black and white sheep dogs are still auctioned at the Auction Mart in Skipton. A cleverly constructed stone mosaic plaque surrounded by three sheep proclaims Skipton as the gateway to the Dales beside Skipton Bus Station. And indeed it is one of those Yorkshire towns that has an abundance of walkers with backpacks and visitors with curious eyes that examine the features and character of the town. 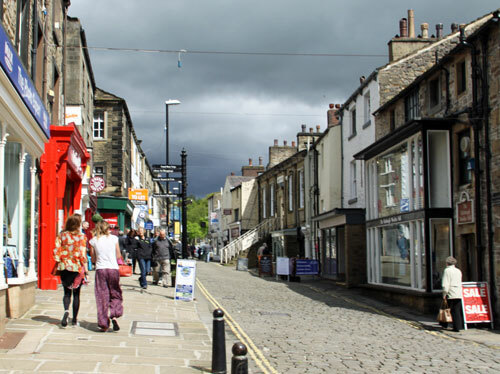 Tourists bring welcome revenue in to Skipton and indeed many part with their cash in the shops on the high street and in the various tea shops and eateries. The Three Sheep Tea Rooms echoes the town welcome sign and gaily displays red checkered chairs on the pavement tables in the cobbled road parallel to the high street. The local people have a direct and friendly manner that soon has visitors feeling quite at home and very glad to be in the warm hearted north of England. Tea and scones adds to that general well-being. There's even a pub in Skipton called the 'Woolly Sheep Inn'. It's impossible to escape anything to do with sheep whilst you're there. The canal passes through Skipton, part of it winding around Skipton Castle in imitation of a moat. There are canal boat rides, narrow boats available to hire for holidays on the canals and walks with ducks to feed along the tow path. 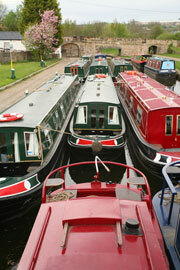 The boats contribute to a colourful picture in the centre of Skipton. Venture down to the Skipton Canal where passengers can catch a narrow boat to admire the statue of Freddie Trueman, one of Yorkshire's foremost cricketers. You may wish to take a short boat ride up to the castle and back and listen to the history of the canal system retold by the skipper. There are walks with views beside the canal and a few ducks. Private day boats can also be hired which could be enjoyable with group of friends and a welcome diversion from walking. On sunny days look out for the ice cream tug boat. Market days in Skipton are lively with a good variety of stalls. Markets are held on Monday, Wednesday, Friday and Saturday. Visit Farmer's Markets for high quality fresh Yorkshire produce - it's good to taste the local Yorkshire specialities when on holiday. Embsay Steam railway near Skipton for steam trains and Thomas the tank engine appearances. Volunteer run. Trains run on Sundays and during the week in the summer to Bolton Abbey station. Romantic 'strawberries & cream' excursions in Victorian carriages on Saturday evenings. One place for unique spectacular scenery eleven miles from Skipton is Malham Cove - a natural limestone cliff with walks to see the limestone pavement. Find out about self-catering accommodation in Skipton and surrounding area. It's always best to stay closest to the places you plan to visit during a holiday in the Dales. Skipton lies just south of the national park and is a good place to stay for a break because it has good tourist amentiies, shops to browse and a busy atmosphere partly created by tourists who swell the population.